Dog Eared Publicity is pleased to bring you John Livingston's LOVE ON THE WINGS OF WAR Book Tour! It is 1967 in Egypt when the rebellious daughter of a government minster first notices a handsome American researcher. Desperate to break away from her powerful and conservative Muslim family, Nadia Kemal approaches Mark Adams one afternoon in the university library and changes her life forever. Nadia and Mark soon fall in love. For a year, their forbidden relationship is fraught with danger and several close calls as they are nearly discovered. As Egypt is defeated in war and the possibility of civil government looms, Nadia’s father focuses on becoming the new leader. Meanwhile after Nadia and Mark secretly marry, they are preparing to leave the country when her father learns of the affair. With his career aspirations now threatened by his American son-in-law, Nadia’s father locks her in an asylum until she signs a divorce paper. As Mark battles for his own life, he frantically searches for Nadia while attempting to distinguish between truth and lies. With seemingly the entire world against them, Nadia and Mark are each left wondering if their love is strong enough to survive. 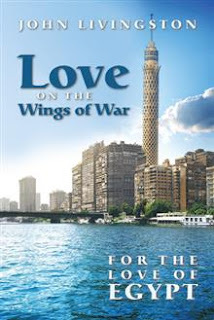 In this historical tale set in 1960s war-torn Egypt, a Muslim girl and an American man begin a journey together driven by forbidden love, danger, and an uncertain future. John Livingston earned his BS at MIT and his PhD at Princeton University. He is currently a professor of Islamic History and Civilization and Modern Middle East History at William Paterson University. Dr. Livingston currently resides in Philadelphia, Pennsylvania. Love on the Wings of War is his fourth book.